Colorado legislators gather to discuss early childhood education. On January 26, 2017, Rose Community Foundation’s Child and Family Development Program Area collaborated with the Early Childhood Funders Network to host the first annual luncheon for Colorado state legislators on early childhood in Colorado. The luncheon was an opportunity to share the history of early childhood in our state with these policymakers and to show them how they can work with funders to enhance the quality of life for children and families in Colorado. Rose Community Foundation Senior Program Officer Elsa Holguín, and Susan Steele, executive director of the Buell Foundation, provided an overview of early childhood funders’ twenty-plus year endeavor to improve early childhood learning and development in Colorado. 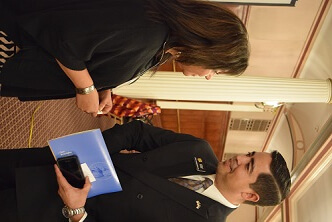 They also talked about the current landscape of early childhood issues. The event was attended by both community partners and new and returning legislators, many of whom expressed excitement for the opportunities that investing in early childhood represent. Investing in early childhood promises big returns including reduced crime, welfare, healthcare costs and educational remediation, as well as greater lifetime education and earnings for early childhood participants. These high-impact investments cannot happen without an informed, engaged legislature working in partnership with the philanthropic community and the communities they serve. 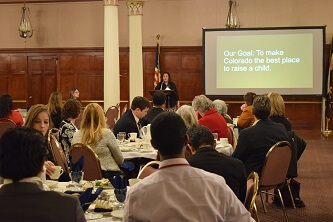 The luncheon gave policymakers the chance to connect with the early childhood community and helped pave the way to working together to make Colorado the best place to raise a child. Convening legislators and community partners demonstrates Rose Community Foundation’s guiding principles in action; working with others, building partnerships and practicing visionary leadership to address community challenges.